Summary: Chance of thunderstorms today, and tomorrow, and the next day, and the next day…. Today, there is a 50% chance of rain and thunderstorms as our high temperature works its way up to 83 degrees. If it isn’t raining, it will likely be partly cloudy with winds out of the south southwest at 5 to 10 mph. Severe weather isn’t expected, but we are in the MARGINAL category (think level 1 of 5 levels of severe weather). 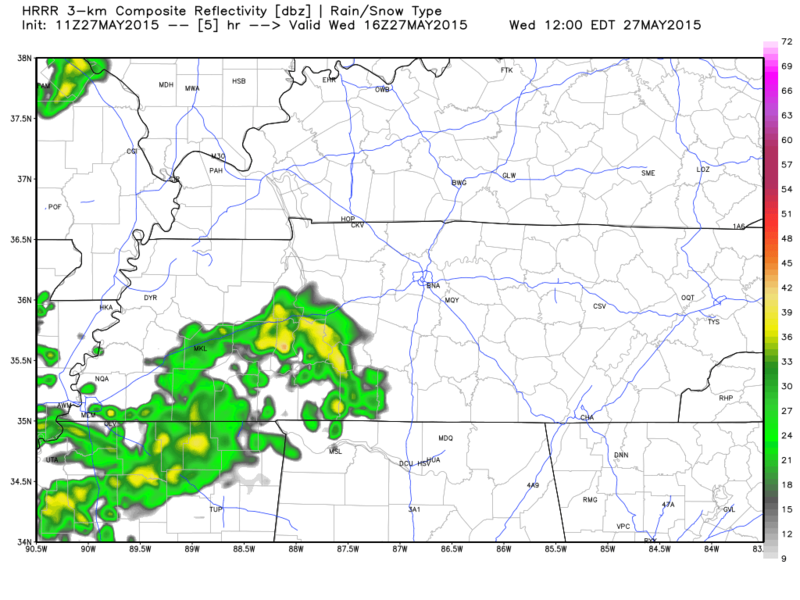 The HRRR is showing early rain chances today at around 11am. Then rain chances come back as nighttime falls. 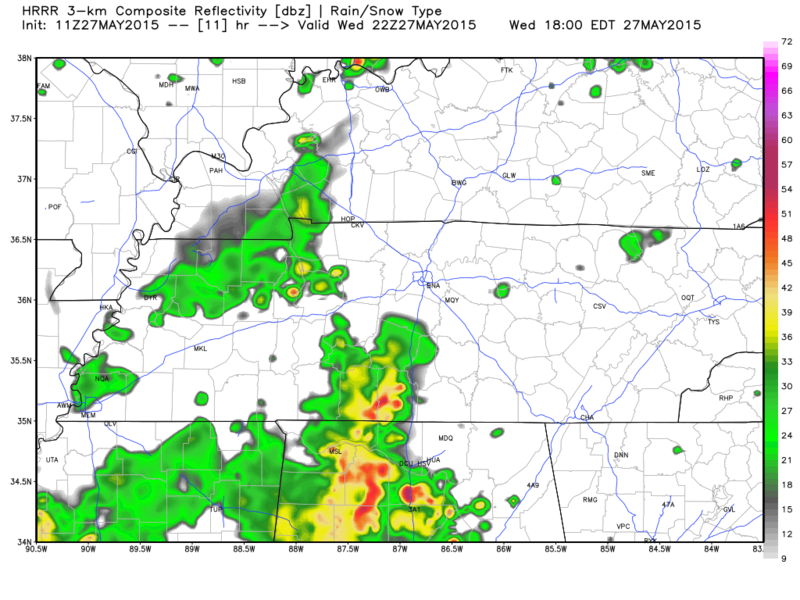 Tonight, expect a 30% chance of rain and storms and an overnight low temperature of about 65 degrees. You can expect Thursday and Friday to be much of the same as today. Both days have a 40% chance of rain with highs reaching in the mid 80’s. Showers and storms are likely to pop during the afternoon daytime heating and dissipate or move out of the area by night. None of these showers currently are outlooked for severe weather, but one or two may grow strong enough to warrant a significant weather advisory (like yesterday) or a severe thunderstorm warning or two. 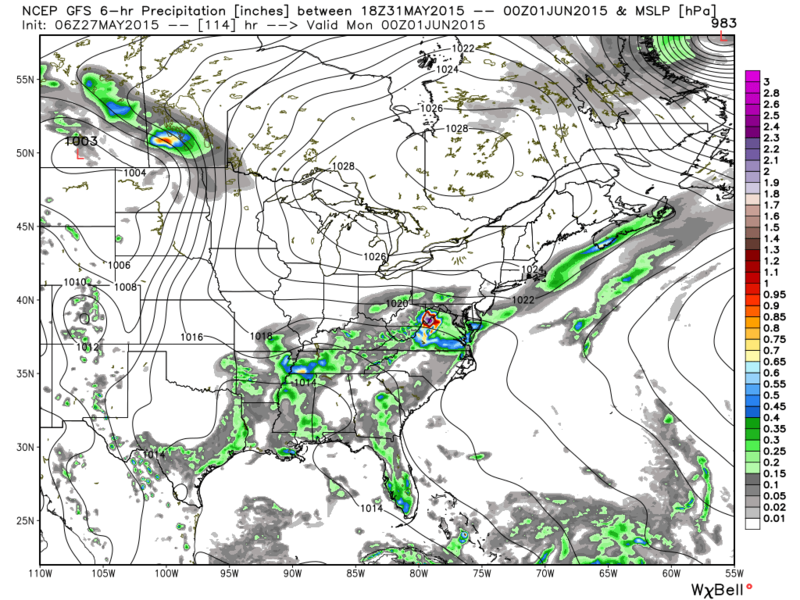 The GFS model is painting rain in the afternoon and evening hours for both days. 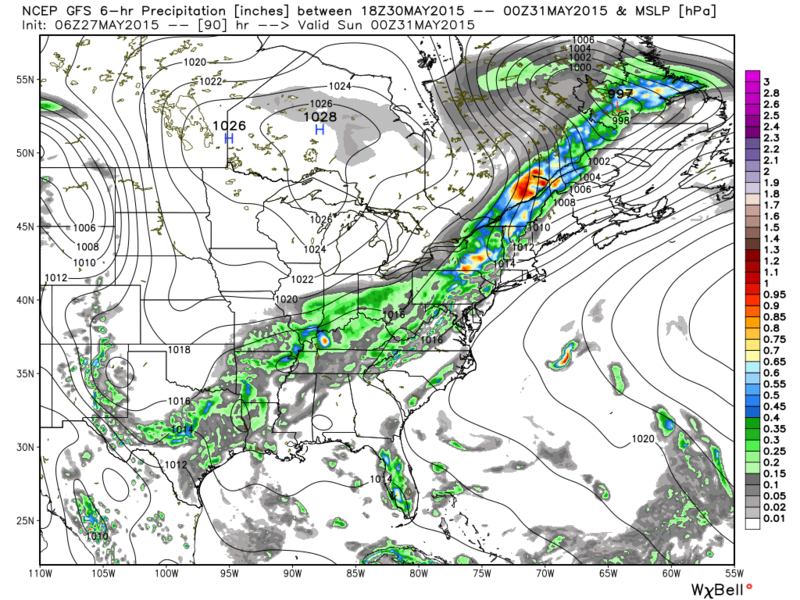 Here’s the GFS precipitation model for Thursday at 7pm. 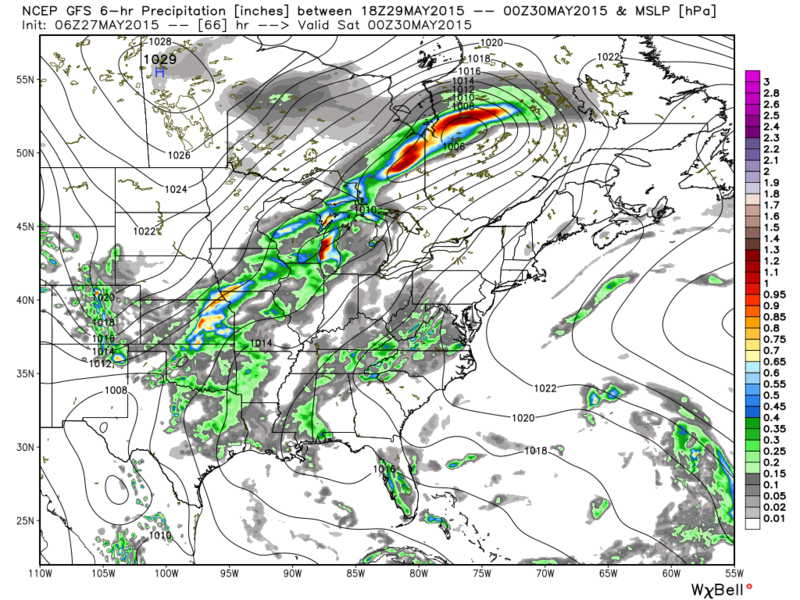 Here’s a look at what the GFS is saying for Friday evening at 7pm. Unfortunately, we are looking at a return to a two day work week being wet and humid. 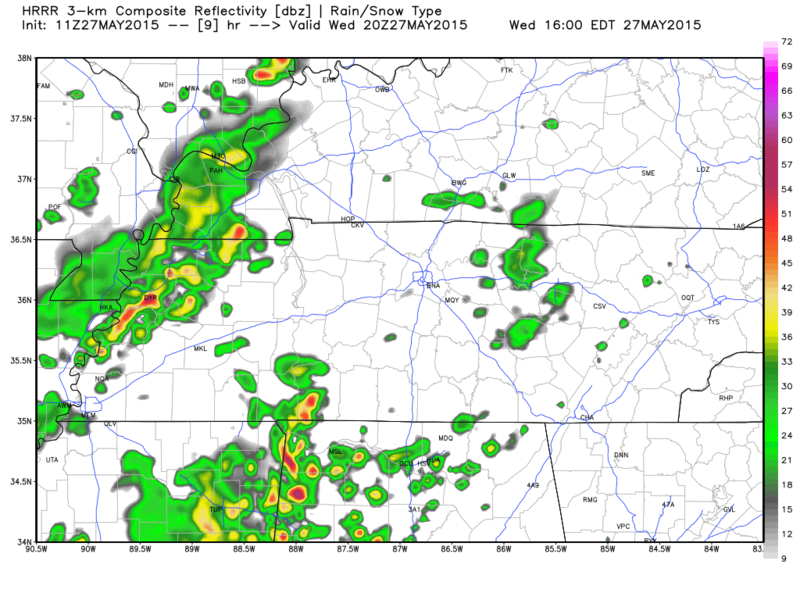 Both Saturday and Sunday expect a 60% chance of thunderstorms with highs in the lower 80’s. If you have plans outdoors, be sure to watch the radar to for breaks in the rain or have an indoor plan ready to go. 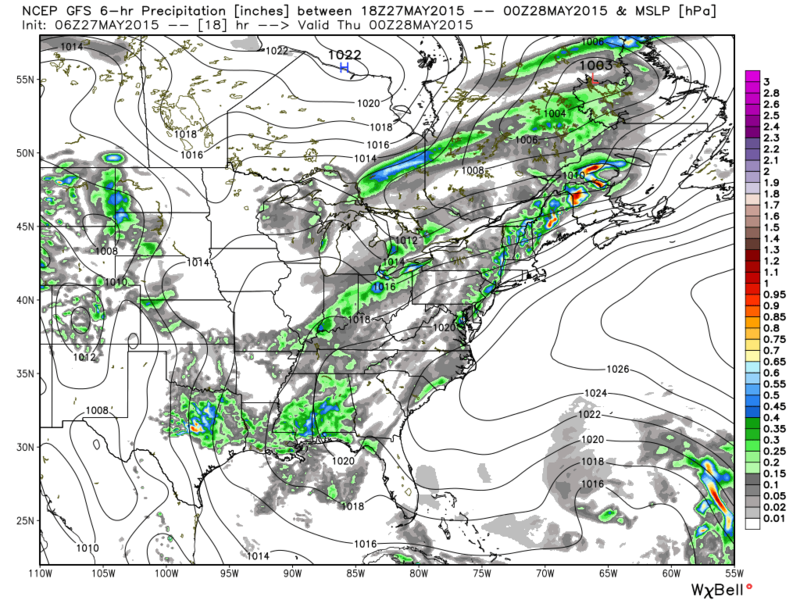 The GFS model shows rain for Saturday at 7pm.